16. Could You Turn A Longer Paragraph Into a Bulleted List? It’s easy to create bulleted lists for your website. And there’s a reason for that: bulleted lists make it easier to scan content. Consider how you might turn one long paragraph (or several short paragraphs) into a bulleted list. 17. 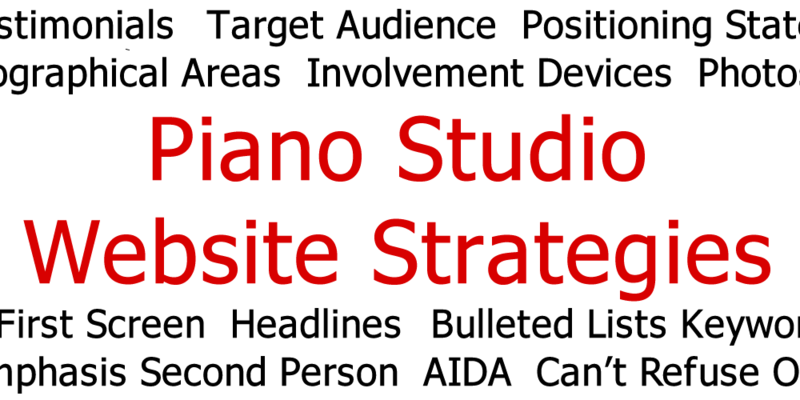 Have you Highlighted Selected Keywords to Help Scanners Grasp Your Content? Emphasizing words using bold text, underlining or italics helps important content stand out. 18. Are You Using “You” or “We”? One of the most annoying things about many business websites – particularly one-person operations like so many piano studios – is the liberal use of the word I. Believe it or not, your prospective students care more about themselves and their needs than they do about you. While that information may be important, it’s not the first thing you want to present to them. (That’s where your “About” page comes in.) Use the magic words “you” and “your” often to involve readers more deeply in your copy. 19. Do You Have A Dedicated Page For Each Service You Offer or Age Group You Teach? If you teach adults in addition to kids, or many hobbyists but also budding pros, create a separate page of your site for each of those groups. This also helps prevent “run on” pages that present every excruciating detail about your studio. 20. Would a “Can’t Refuse Offer” Make Sense? A “can’t refuse offer” can turn a visitor’s interest into excited action. If your studio is relatively new and you want to fill it up with students quickly, such an offer could be particularly valuable. An obvious “can’t refuse offer” is the free trial lesson. Another might be the offer of “your money back for the first lesson if you’re not completely satisfied.” Can you think of others? How many of these strategies can you implement before learning about Strategies #21 through #25 in Part 5 of this series?